Hey ladies, and friends of the ladies! Are you looking for a gift for yourself or your loved one? We know how difficult it can be to come up with a different and thoughtful present for a loved one for various occasions, even if that person happens to be a woman; for whom there is simply no dearth of variety of gifts available. 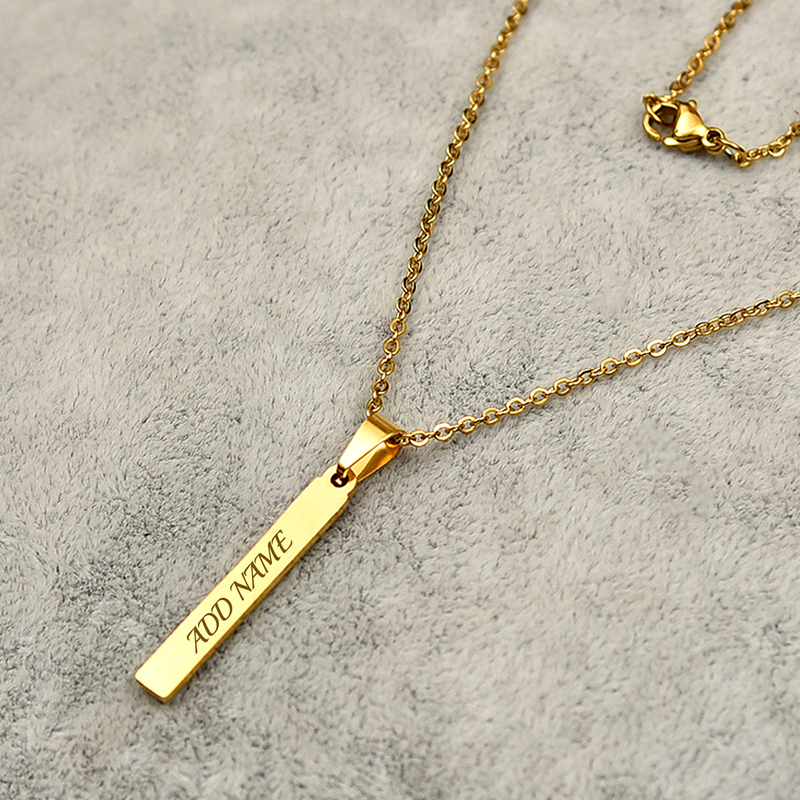 Have you ever thought of getting personalized jewelry as a gift? If no, you should. And if yes, go for it again! Customized jewellery is absolutely chic, jazzy, unique and trendy. You can patent them with initials, name and even a heart-touching but worth flaunting quotes. And IGP is home to beautiful and distinct personalized jewellery that are favourite picks of many. Here are our latest additions, just for you and the lady you adore. Buying a wedding anniversary gift for your beloved? Then you need a gift that is not just about her but you as well. How subtly to do that other than giving her this pendant? 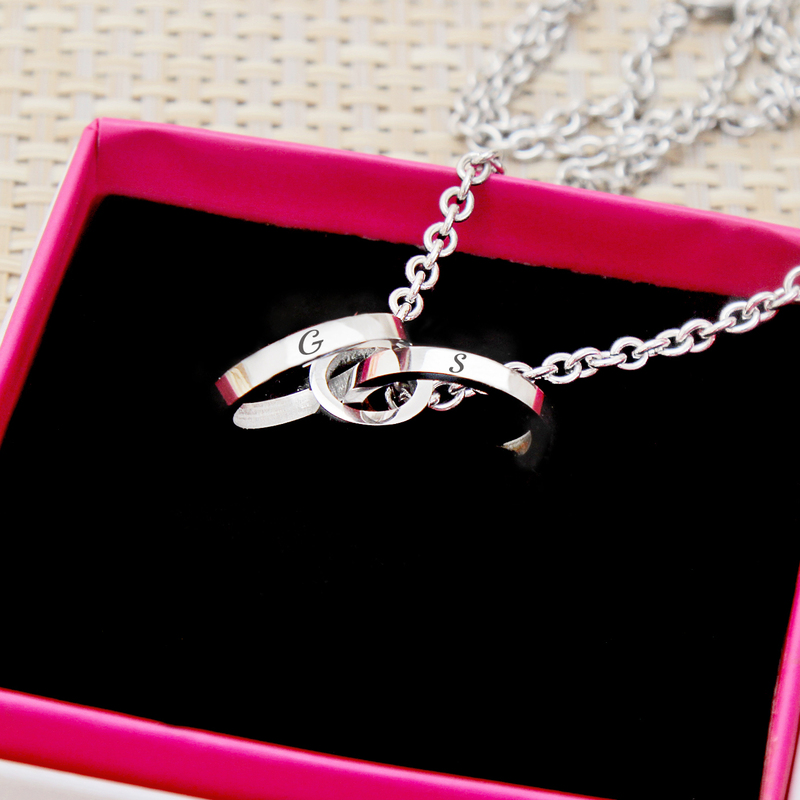 This glam pendant sporting uberly classic design and rings that are personalizable with your and her initials will be the best gift she can ask for on the occasion. Is she a fan of bracelets? 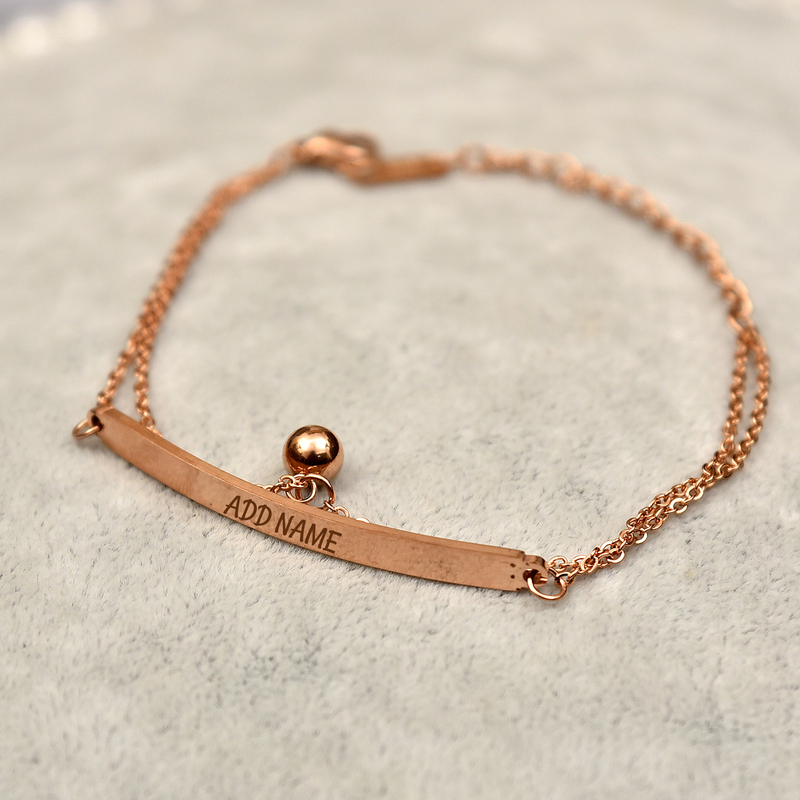 Then we recommend this personalized bracelet for her. 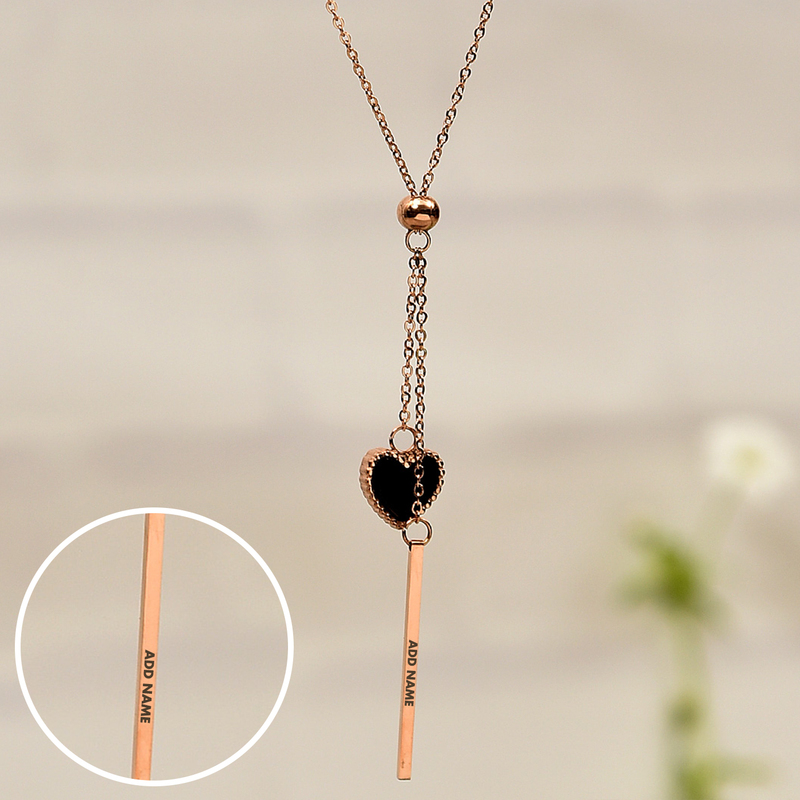 It has cute heart and teddy bear shapes around the chain with a beautiful heart shape in the center. The hearts represent love, attraction, femininity and bear shapes represent cuteness and fond memories of childhood. This heart is personalizable with your lady’s initial. If she is more on the sophisticated and stylish side of things, pick this one for her. This stunning stainless steel bracelet has a rose gold finish with heart-warming butterfly shapes. These shapes symbolize freedom, inspiration, and cheerfulness. This pendant will pave its way into the heart of your favourite woman. This chic silver pendant will go with anything she wears and make her look gorgeous. The pendant is rectangular in shape which symbolizes order, security, honesty, rationality. 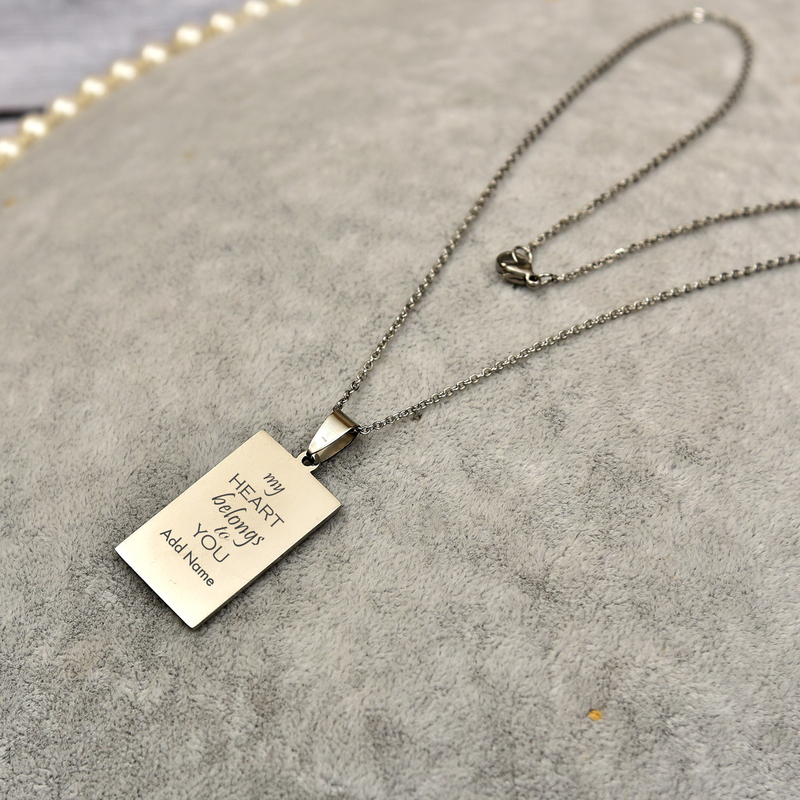 The special thing about this personalized name pendant is that apart from adding her name you also get to express your feelings with a beautiful love quote imprinted above her name. If you are a lady looking for a cool fashion accessory to go with your urban wardrobe, then this one is the right pick for you. This statement-making pendant will make your top-jeans or skirt combo stand out and look more gorgeous. 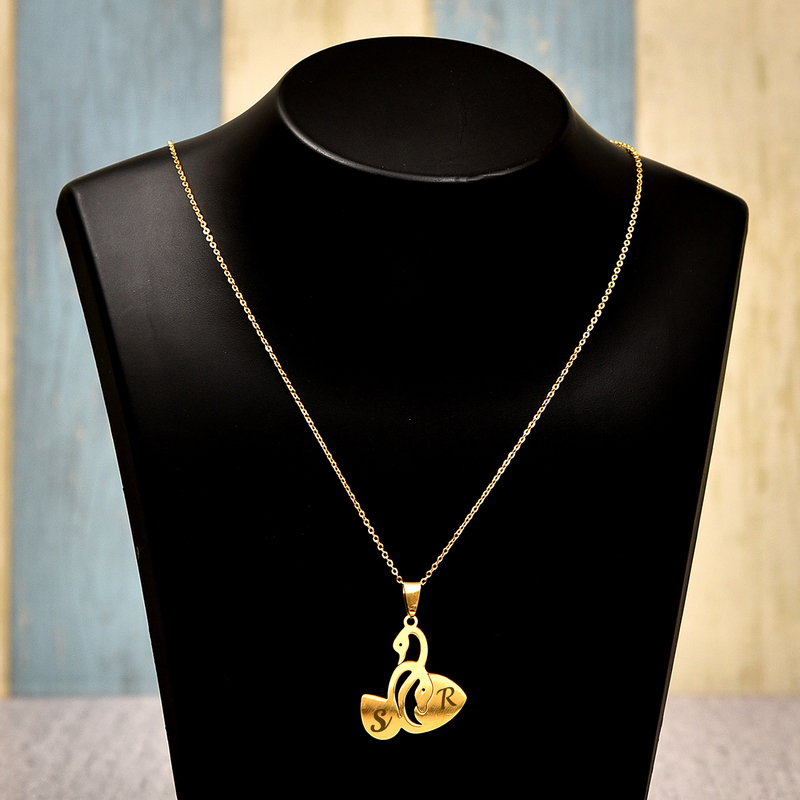 The smart addition of your name in the neckpiece will add more glamour and jazz to your appearance. Is the leading lady in your life a fan of Pac-Man? 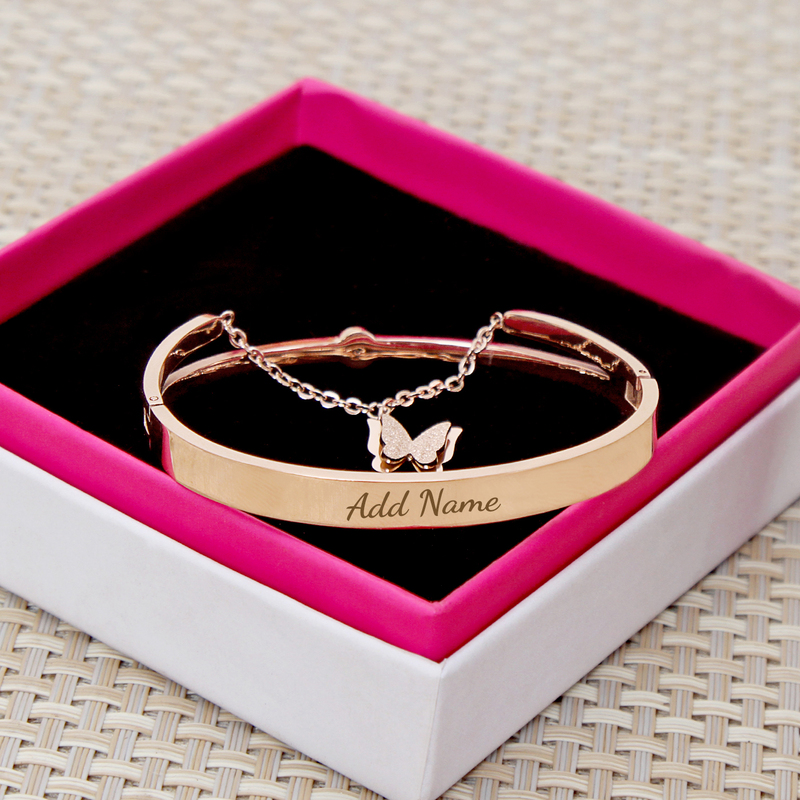 We have an innovative and stunning personalized name jewelry for her. 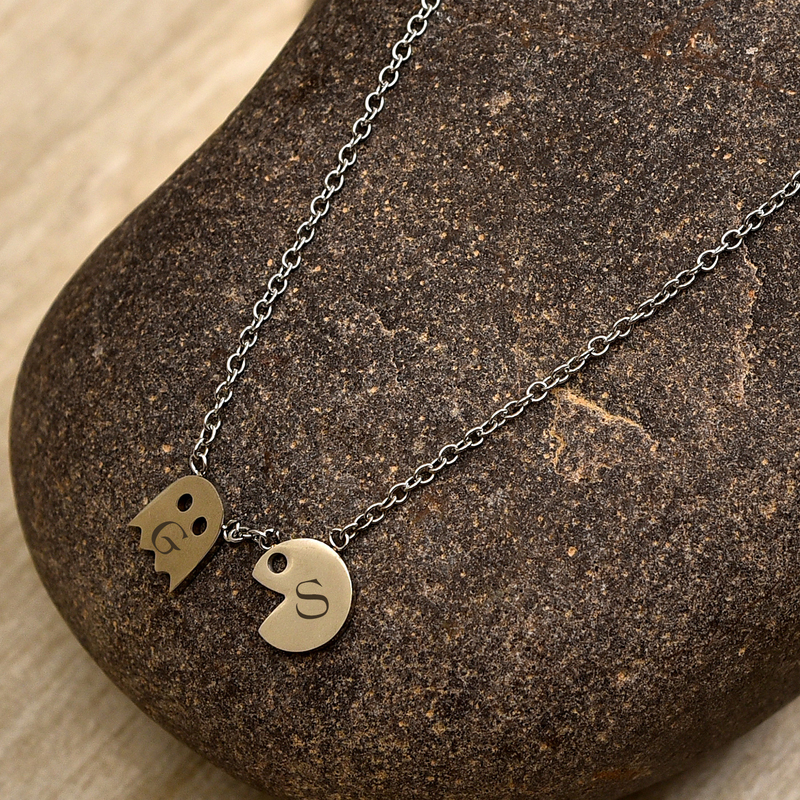 It has a stainless steel chain with two Pac Mans at the center, which can be personalized with your and your sweetheart’s name’s initials. Cute, right? 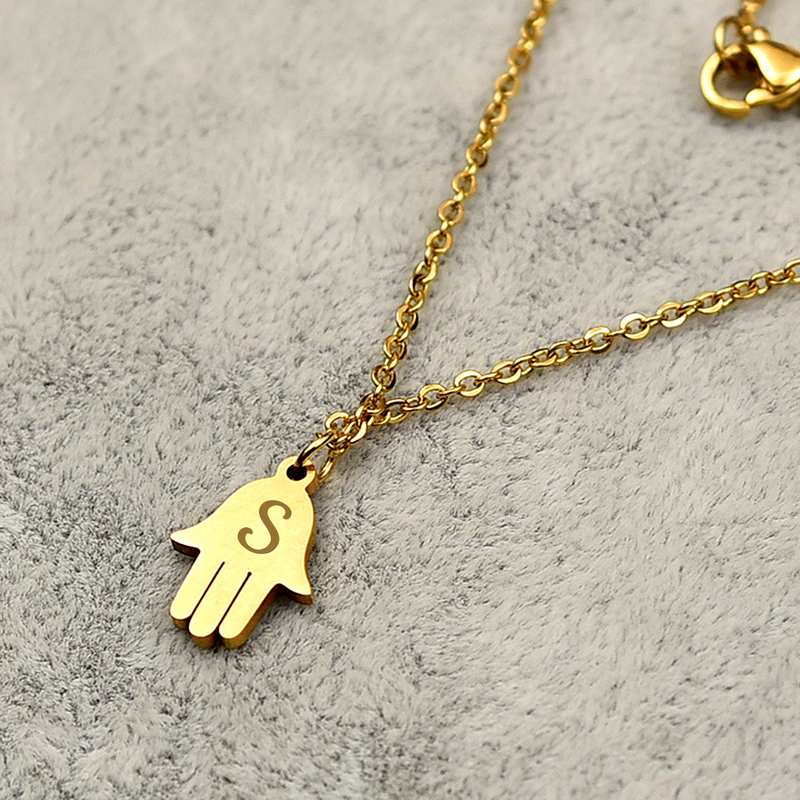 This gold coloured neckpiece has an adorable Hamsa hand pendant that you can personalize with her initial. The Hamsa hand is famously used in jewellery to ward off negative energies. Here’s a creative and delightful way to say nazar na lag jaaye to the lady you love. Since ancient times, ghungrus have been restricted to the feet of the wearer. This necklace breaks the norm and promises to adorn the neck and turn the entire appearance of the wearer charmingly distinct. 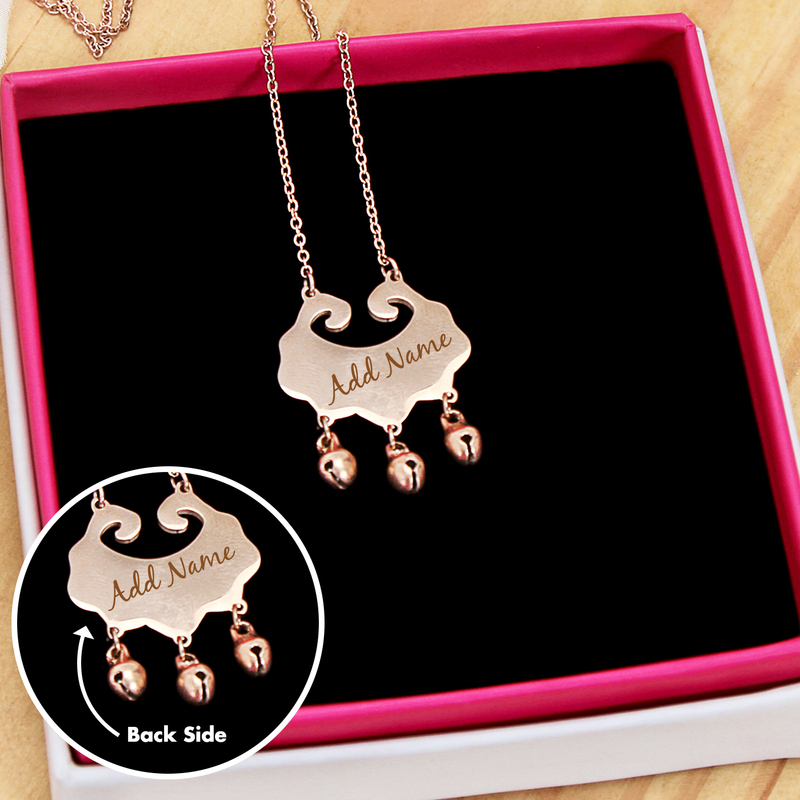 This stylish personalized necklace has a chic central design with three ghungrus hanging from it. This one is that rare jewellery that will look great on women of all ages. So you can pick this one for your mummy as a Mother’s Day gift. Here is an example of creative, intelligent and intricate designing. If you look at this pendant from a distance, it appears like a fish. But when you look at it closely, you will see two swans intertwined with each other. Customize the tail and mouth of the ‘fish’ swan pendant with your and your partner’s initials, and you have an extraordinary gift ready to make her go speechless. Does your lady love has a taste for classy things? Does she suffer from intolerance from anything that is too flashy or stylish? Then you have to be very careful while selecting a jewellery gift for her. No worries when we are near. Pick this one for her. This bracelet has a stunning rose gold finish that will add a perfect finishing touch to her modern and traditional attires. It has a personalizable bar-like design in the front that is very unconventional yet subtle. The bead drop adds the chic factor without making the bracelet look overdone. So give the gift of your love with something that is out of the ordinary. Something that is made just for the receiver. And if you are looking for an occasion to buy from this personalized jewellery collection, pick one for Mother’s Day. We all miss out on spending time and making everyday special for our mothers owing to our busy schedule. Read through our blog- A Tribute to the God One can see; Mother to learn how you can make every day lovely and memorable for your mother.